Jeanne Kaliszewski preached this sermon with us for the second Sunday of the Easter season. I am not someone for whom faith has come easily. Sometimes faith feels like a slippery thing, like trying to catch a fish with your bare hands; you see it glinting, darting in a sunlit pool, and it slips through your fingers just as they close around it. One of my favorite verses in the Bible is from the father who brings his child to Jesus to be healed. When Jesus tells him all things are possible through faith, he cries out “I believe, help my unbelief”. So that kind of makes Thomas my favorite disciple. In fact, when I took the Buzzfeed quiz “Which Disciple are you?” I actually got Thomas, between taking the “Which Downton Abbey character are you?” quiz (Lady Mary), “What kind of dog are you?” quiz (Great Dane), and “Which Game of Thrones character are you?” (Tyrion). Thomas is a sceptic, a realist, a pragmatist, and yes, a doubter. But this view of Thomas is one-dimensional. Thomas is also disciple, a first follower of Christ, a gospel writer. Although we do not have much detail about Thomas, about his life and the sacrifices he must have made to follow Jesus, like all Jesus’ early followers he must have abandoned much to follow this new and radical teacher. In the words of Sara in her sermon a few weeks ago, Thomas was “both/and”. He was both a faithful disciple and a sceptic. He was both a believer and a doubter. And make no mistake, what Thomas was being asked to believe by the other disciples that first day after Jesus’ crucifixion was, simply, unimaginable. Despite some veiled comments by Jesus here and there during his life and ministry, resurrection was not what the disciples expected or even hoped for. There was no precedence for this, no anticipation on the part of the disciples. That is why Mary does not recognize Jesus and mistakes him for a gardener, that is why Thomas is incredulous. This was resurrection, true and corporeal. In our “spiritual not religious” age resurrection has become a metaphor of sorts, a stand-in for life after death or for returning to the fabric of the universe. That is not what is going on in this gospel, this is the real Jesus in his actual body, raised from the dead. The painting by Caravaggio “The Incredulity of Saint Thomas” illustrates the visceral physical presence that is Jesus in this gospel. (Go ahead, look it up on your smartphone if you like) He is guiding Thomas’ hand to the wounds in his side, Thomas looks stunned and confused, staring as his finger enters the hole in Jesus’ side. Despite Thomas’ doubt, in fact because of Thomas’ doubt, Jesus seeks him out. Jesus appears to him, returns to the house of the disciples in order to help his unbelief. Jesus invites Thomas to touch his still fresh, still raw wounds. Despite his doubts, because of his doubts, Thomas’ profession of faith “My Lord and my God” is all the more profound. In Surprised by Hope, historian and theologian N.T. Wright describes the scene in today’s gospel: “Thomas, like a good historian, wants to see and touch. Jesus presents himself to his sight and invites him to touch, but Thomas doesn’t. He transcends the type of knowing he had intended to use and passes into a higher and richer one”. Cross over to the other side. The Word is near, and calls our name. New hope through that which faith now knows. There was a time when my faith felt like a fragile thing. I would hear Neal de Grasse Tyson or Christopher Hitchens on the radio and I would hurry to turn it off, afraid my belief could not withstand the questions they posed, afraid of the seeds of doubt that their learnedness and self-assurance would plant. But by working through those doubts, within these doubts, I find something richer. The faith I found on the other side of my questioning was more complete, more satisfying. Thomas is brought to faith, to a profound and enduring faith, through sight and touch. Unlike Thomas, we do not have the body of the risen Christ before us, but like Thomas we can use our senses to find Christ here and now. Jesus said to Thomas, “Put your finger here and see my hands. Reach out your hand and put it in my side. Do not doubt but believe.” “Reach out your hand and put it in my side”. Although Jesus does not stand before us, we can still reach out our hand and put it into his side, reach into him and feel. Where do you see Christ? Where do you feel him? I put my hand into Jesus’ side in the Eucharist, in the bread still warm from the oven and the hands of the priest, in the wine’s exploding flavor as I take a sip. I put my hand into Jesus’ side as I sing “Oh sometimes, it causes me to tremble, tremble, tremble” and when I stand up here before all of you. I put my hand into Jesus’ side when I attend book group with my friends from JOIN. I put my hand into Jesus’ side when I see the smile of my children, hear the laugh of my husband, feel the hug of my mother. In her memoir of faith Easter Everywhere Darcy Steinke observes: “Since I was a teenager I’ve lived in a world mostly devoid of divinity. But now I see the sacred includes not just churches but hospitals, highways, costume jewelry, garbage dumps, libraries, the cruising area of public parks. Also pet stores, subway platforms, Ferris wheels, and rain storms”. Like Thomas, we are asked to believe in the risen Christ and, like Thomas, we often respond with bafflement, disbelief, and doubt. And like Thomas we can be “both/and” Easter people, we can have both faith and doubt. God does not want us to abandon our intellect, our questions. But, as Thomas found, as the philosopher Wittgenstein notes, “It is love that believes the resurrection”. God does not ask us to abandon our doubt, to stuff it down inside us and ignore it. We must walk through our doubt, extend our hands through the haze of disbelief and into the side of Jesus. Let these branches be for us signs of his victory. Remember that prayer, way back in the beginning of the service? Palm Sunday was for generations—centuries—a celebration of Jesus’ triumphal entry into Jerusalem, described in the reading we heard from long ago in the parish hall. It was an ironic triumph for those of us who know—as Jesus did—that for him, Jerusalem meant death. And yet, the procession was a time of celebration The promise of victory was in the air. Let these branches be for us signs of his victory. The people along the road treat Jesus like a king, shouting Hosanna to the Son of David, their way of saying “Long live the King!” “Praise to you, our king and our redeemer!” When we process around the neighborhood, singing “all glory, laud, and honor,” we act out that part of the story as much as we act out the passion gospel we just read. And yet it is usually the passion gospel that occupies the Palm Sunday sermon. As if what we just heard needed any interpretation or reflection. I would like to linger instead, for a few minutes, in that celebratory mode associated with Jesus’ procession through the gates of the Holy City. Let these branches be for us signs of his victory. What victory? What are we celebrating? Jesus has just finished a whole series of hard teachings and challenging conversations with his disciples. (Go home and read Matthew 20 and you’ll see what I mean.) He has called his hearers to task, challenging them to break through the existing religious structures of the day, to hear of God’s call to teach and to heal. One might say part of what we celebrate is victory over religious misunderstanding. Jesus rides a donkey, while Pontius Pilate, the Roman governor, would likely have ridden into the city on the same day through another gate. Pilate would have ridden a war horse flanked by soldiers to protect Roman interests during the Passover festival, where there was often political unrest. Jesus’ choice of the donkey is a victory over pride and political trappings. The donkey is a sign of humility. Do nothing from selfish ambition or conceit, but in humility regard others as better than yourselves. Let each of you look not to your own interests, but to the interests of others. Let the same mind be in you that was in Christ Jesus who, though he was in the form of God, emptied himself, humbled himself. The victory we celebrate today is the victory of humility over pride. The victory over the tyranny of self. If you want to experience victory over self, do something foolish and awkward in the name of Christ. If you want to be like Jesus, ride a donkey. There is, of course, another victory to celebrate, but we’re not there yet. In the coming week we are invited over and over again to enter into Christ’s death. I hope many of you will join us in some or all of our Holy Week services. 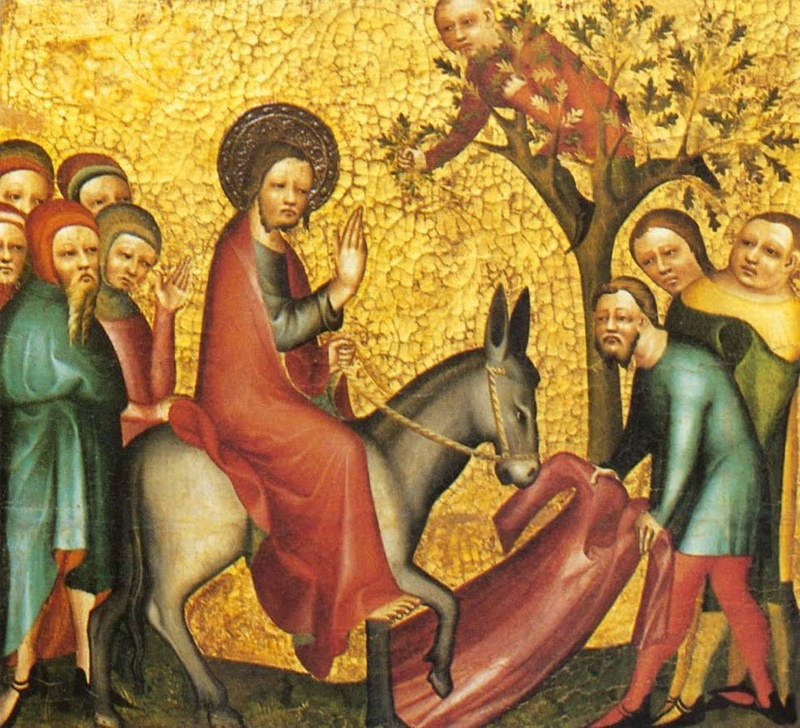 This Holy Week story begins with the procession on a donkey—the story we read together of Jesus’ arrest and death was tacked on midway through the last century because fewer and fewer people were coming to church on Good Friday. Who remembers when school and liquor stores all over the country were closed on Good Friday? 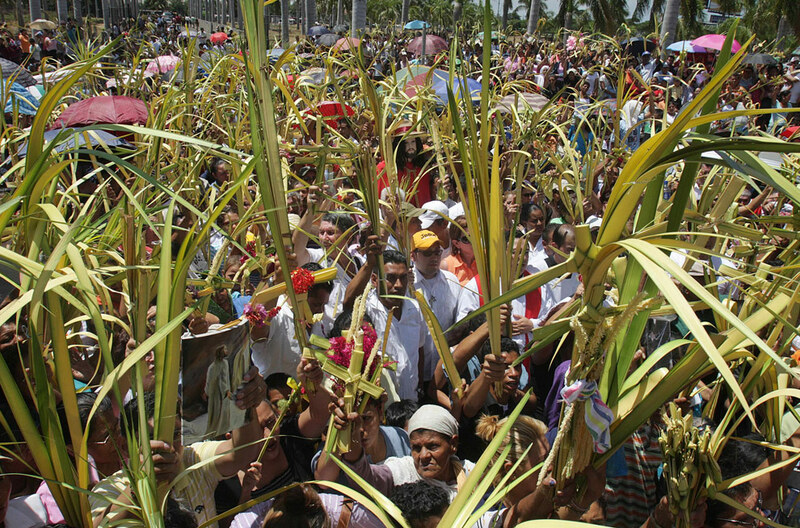 The Passion Gospel was added to Palm Sunday because without it, people who didn’t go to church during Holy Week missed the painful and miserable death that must come before Easter. Let us journey together through the coming week and immerse ourselves in Jesus’ suffering and death, noting glimmers of victory and hope along the way. Then when we sing, on Easter morning, “This is the feast of victory for our God,” the words will be truly meaningful. Let these branches be for us signs of God’s victory.